Which way do we go? Compasses were graffitied all over The Funk Zone. Were they supposed to lead us somewhere? Welcome to Funky Town. This weekend, I decided to drag mine and my boyfriend's butts off of the couch and go for a little adventure in The Funk Zone. 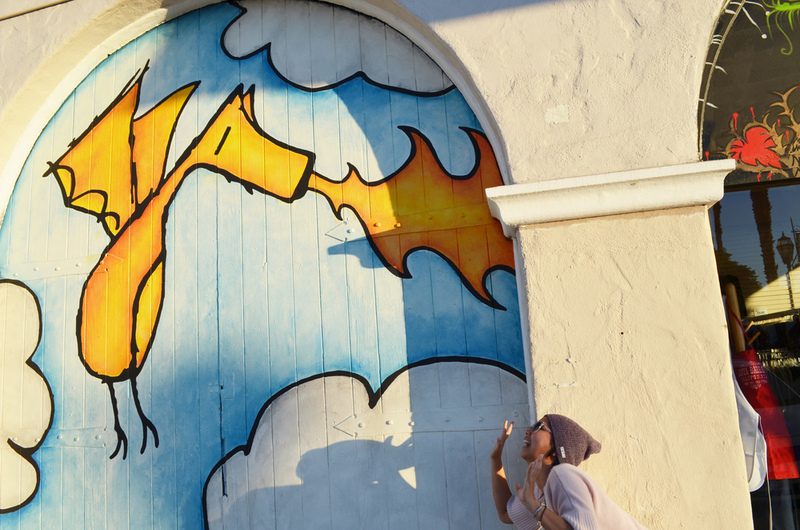 The Funk Zone is Santa Barbara's hot spot for trendy tasting rooms, art, and local businesses. I mainly wanted to look at murals and go for a wine tasting, so we did just that. As it was almost dusk when we arrived, we decided to walk around and look for wall murals. The Funk Zone is a small industrial area just off of Cabrillo Blvd. in Santa Barbara. It's small, but a lot of the artsy stuff is concentrated towards the State Street side. We managed to find a whole wall of murals. Here are a few of my favorites. As the sun started setting, we headed towards Anacapa Street, where most of the popular tasting rooms were located. I had looked up a couple of places to go to and decided to try a place called Corks n' Crowns. However, the patio was packed with people. We didn't even venture inside. It must be pretty good if many people were there, but I wasn't looking to push through a large crowd. Right next door to Corks n' Crowns, however, was a tasting room that I thought used to be the Anacapa Dive shop - I used to take swimming lessons there. Based on that, a pretty patio with twinkle lights, and The Burger Bus food truck parked in front, we were drawn towards the Municipal Winemakers tasting room. The inside was overwhelmingly shabby chic and there was a good-sized crowd - enough to show that the place was good and not enough to take up every seat in the house. When we went up to the bar, the staff was friendly and informative. It was $12 for a flight of 5 wines. And there were free crackers. We took a glass and a basket of crackers, claiming a spot on the porch in front. It was a really nice atmosphere and it never got super crowded. My boyfriend and I don't know too much about wines, but it was a good opportunity to learn what I like and what I don't. It was also a good chance to catch up with him - it had been a few weeks since I'd seen him. We also had some fun with my camera, making some light art photography as cars passed by. Simply put, if you're ever looking for a chill adventure on a nice night in Santa Barbara, think about hitting The Funk Zone.